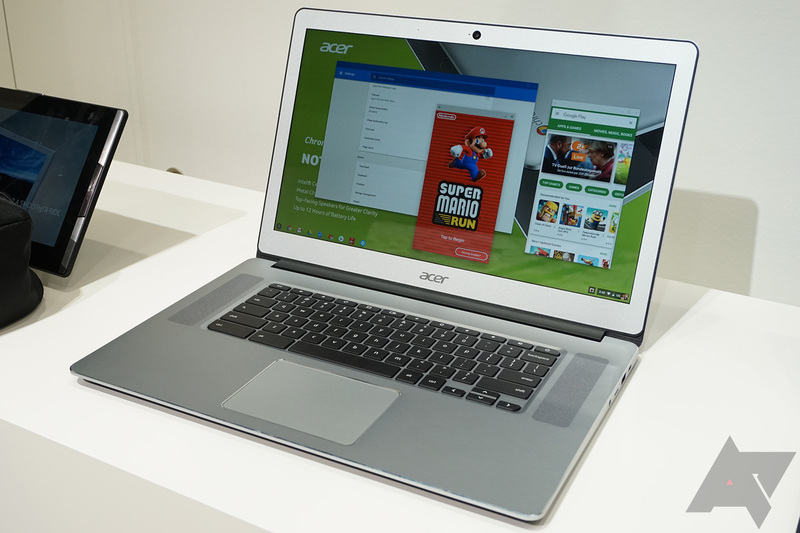 I had a chance to check out the new Chromebook 15 at Acer's IFA booth, and it does look and feel like a significant step up from the company's older Chrome OS machines. The screen assembly and top of the body are aluminum, which makes it a bit on the heavy side at 3.79 pounds. That's not bad for a notebook with a huge 15.6-inch display, though. The weight is also somewhat mitigated by the bottom section of the machine, which is still just plastic. There's no fan whirring away inside this machine, either, but that also means it'll come with modest hardware. More on that later. The display is big, but it has a respectable resolution of 1080p. It looks sharp enough at normal viewing distances, and the brightness is solid considering it was completely legible under the harsh lighting at IFA. The Chromebook 15 is also a full touch device, but it's not convertible. You can reach out and interact with elements on the screen, which is perfect for Android apps (which run on this device out of the box). However, it's not going to be terribly comfortable to keep reaching over the keyboard to touch the display—that's why convertibles are a thing. It'll be available in a non-touch variant if you want to save a few bucks. 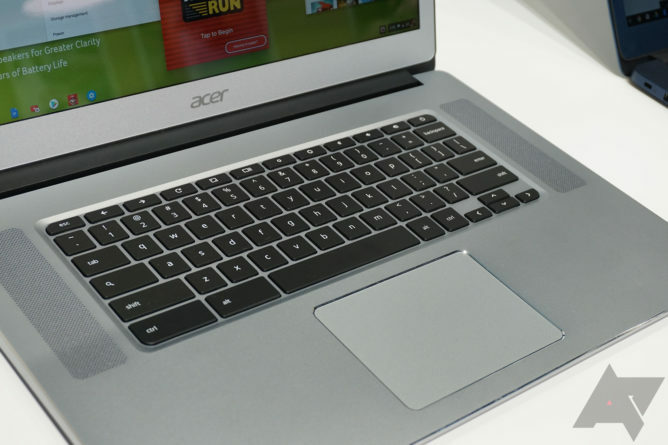 There's a lot of surface area on this computer, and Acer took advantage of it by including a rather large trackpad, as well as some top-facing speakers on either side of the keyboard. The speakers seem much louder than what you get on other Chromebooks, which have to make do with smaller sound systems. Even without turning the volume up, I could hear the sound loud and clear over the constant din of background noise. The keyboard itself is typical of Chromebooks. It's a compressed ANSI layout with small arrow keys and a row of Chrome OS-specific function buttons at the top. The keys have a light tactile bump, short travel, and a bit of a spongy feeling when you hit the bottom. It's not a great keyboard, but it's very much what I'd expect on a Chromebook in this price range. The keyboard is, however, backlit. Connectivity options on the Chromebook 15 look excellent. 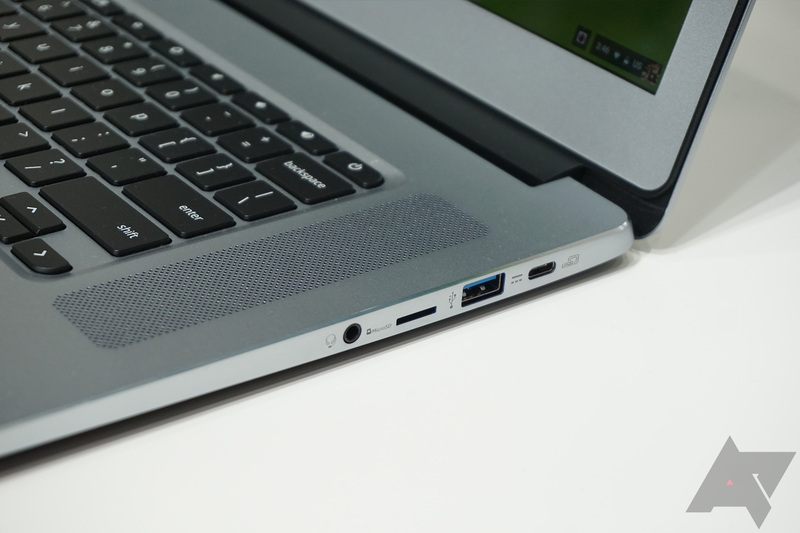 It has a USB 3.0 Type-A and USB 3.1 Type-C port on both the left and right edges. 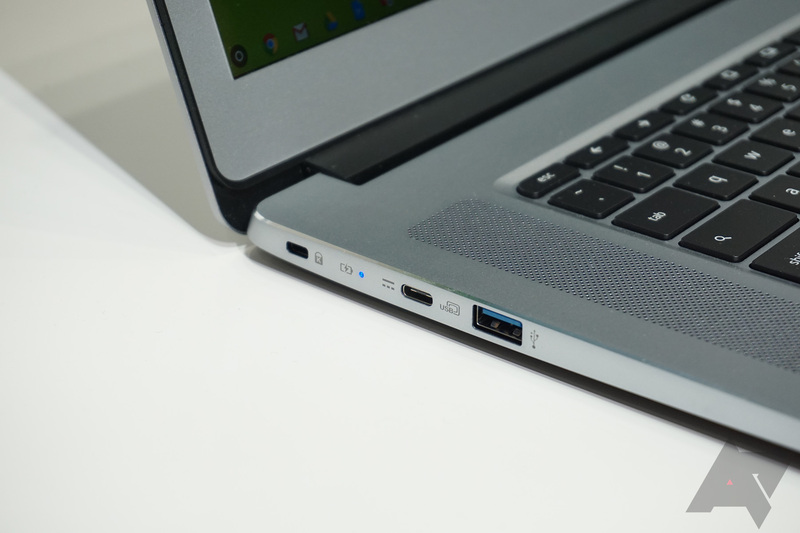 Even better; you can charge the Chromebook 15 via either of the Type-C ports. That's the same setup used on the second-gen Google Chromebook Pixel. There's also a headphone jack and a microSD card slot on this computer. 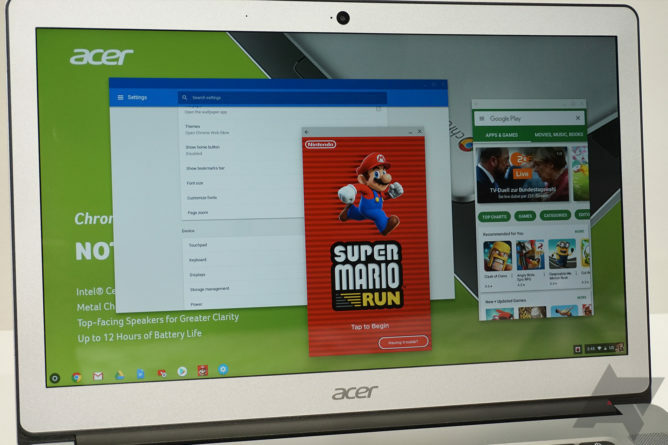 The Acer Chromebook 15 will come with either a dual-core Celeron chip or a quad-core Pentium. These aren't the most powerful CPUs in a Chromebook, but they don't require a fan. The various configurations will also have either 4GB or 8GB of RAM. The model I tested was the most powerful configuration, and it ran everything well. Chrome OS itself was fast to launch new windows and load sites, and 8GB of RAM should be plenty for Chrome OS. On the Android side, I installed a few games and launched them without issue. Super Mario Run played buttery smooth on the Chromebook 15. The gameplay still sucked, though. That's not Acer's fault; I just felt the need to vent. The Chromebook 15 is considerably larger than most Chromebook's I've used (378 x 256 x 18.9 mm), though it's a bit slimmer than the previous gen CB15. It looks quite monolithic when closed, and it takes up a big chunk of desk space when it's open. Some people really want that extra screen real estate, though. The Chromebook 15 would be tough for me to carry around, but you can pick one up yourself in October, starting at $399.